British actor best remembered for playing Alfred the Butler in the 1960s Batman TV series and for roles in films such as The Uninvited, Desiree, Marnie, Journey to the Center of the Earth, Moonfleet, Macbeth, Johnny Belinda, and Big Jim McLain. Napier believed the thing that held him back in his career was his height of 6 feet, 5 inches: "How many parts I lost by simply standing up! The damnable thing about it is that I could see their point. It's the same on stage as on a set. I throw everything off." I was also ridiculously tall - 6 feet 5 inches. Very often I would lose a job because I was too tall for the leading man or whatever...People who have only seen me on the stage or screen are always surprised, when they meet me, that I am so tall. Rob, he had claimed twice or thrice he was 6'5" tall, then how you listed him as 6'6", explain!? He might have rounded down his height because he was a very tall man. I think christopher lee is 6'4.5" at peal and alan napier is 6'5" at barefoot and 6'6" with shoe. Thats Clear! 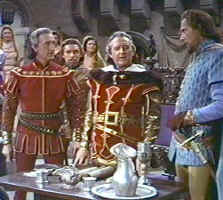 He is solid 6'5"/196cm or may be 6'6"/198cm.But he is weak 6'6" with 6'3" Basil Rathbone in Court jester where Rathbone looks 6'2" and Napier is 6'5" . In Loyalties Napier may be 6'5.5" and Rathbone would be solid 6'3"
This Guy made Sean Connery look below average height. He was taller than 6'5. He had Connery by 4-1/2". 6'6 Sounds More Accurate. Connery I believe said he was 6'1-1/2" Once , I have to find that quote. I doubt Connery was under 6'2, if he was it was by very little. He still looked 6ft6 in his 60's...I wonder if he was in fact closer to 6ft7 peak? If he was 6'5" range it's for sure 197 or fast approaching it. In essence he'd bea weak 6'6" there's no argument there Willes and maybe he was a full 6'6" who downgraded himself but my guess is he was 6'5" range 6'5.5-.75 possibly or just near the 197 mark and rounded down. And you're right 6'6" is a bit high not a lot of guys who aren't that actual height will claim it and tons of 6'5.5 guys round down but that's common after reaching 6'2/6'3. I even see guys at 6'0.5 claim 6'0". Not everyone will round up. I get down on a normal day to 6'4.33 (6'4-6'4.1 is my absolute low).and just say 6'4" most of the time because I'm closer to it than 6'5". Napier had an EASY 4 inches on Connery in Marnie stood better. If you're going to argue Napier was 6'5.5 Canson then Connery would have been nearer 6'1. I would definitely rule out 196, see him with Connery, John Wayne and Adam West. I wouldn't want to argue 6'5.5 either, to me he looked an obvious 6'6 guy. He probably downgraded his height so he could be cast for more roles. But he isn't fooling anyone, he was clearly way taller than just 6ft5. 6'5" seems like a round down maybe 196-197 although clearly very lanky which contributes to his height perception. He also seemed to retain good posture and height into later years which is atypical. True 6ft6 guy who was uncomfortable with his height. You can't rule out 199cm either. There must have been a rule back in those days for actors looking for leading parts to downgrade by 1-2 inches in the same way there was the 2 inch rule for the shorter actors. The funny thing is that in person it would be OBVIOUS. You can't hide a 6 ft 5-6 guy, slouched or not. He wasn't 6'7 as Steve says but generally without a doubt this guy looked in the 6'6 ballpark, you could probably argue 199 at times. I've spotted him in a huge range of roles in films, sometimes in historical epics or something with costume and makeup you don't immediately recognise him but when you see him stand with people and hear the voice you know immediately it's him! I think Napier once tried claiming 6 ft 4 or 6'4.5 too LOL! One of the rare cases of self downgrading but you can imagine the folks at RADA and agents everywhere else told him to never say his real height! Editor Rob: I've not seen what he had in the spotlight directory, but christopher lee early on did have 6ft 3 for his height in an edition I have. Yeah he did Rampage, no less than 4 inches on Connery in Marnie. 6 ft 5 is absolute poppycock for this guy! Did he really have 4in on Connery? The only time Alan didn't quite measure up to another 6' 6" actor was in the "Daniel Boone" TV show excerpt easily found on-line. Alan and Fess Parker are standing toe to toe on level ground having a dispute and Fess seems the taller by half an inch. I can't explain this one other than the director maybe wanting Fess to have the slight height advantage so as to dominate the scene. Napier always added an element of class to the roles he played. I understand he was a terrific person off camera. What's even more impressive about Alan is that he was still 6' 6" in his very senior years, when most men lose height. During the "Batman" series Alan also guested on the "Beverly Hillbillies" playing a friendly pharmicist/chemist, where he towered over Buddy Ebsen who was still a strong 6' 3" then. Napier made both Douglas Fairbanks Jr. and Anthony Quinn look short in Sindbad the Sailor. Fairbanks was at least 6' while Quinn was 6'1". Napier along with Buddy Baer were the tallest character actors in Hollywood back during the Golden Age. They made just about everyone look tiny. Milland really has me worried at the moment!!! Rob can you add a photo and add best remembered for playing Alfred the Butler in the 1960s Batman TV series and for roles in films like The Uninvited, Désirée, Marnie, Journey to the Center of the Earth, Moonfleet, Macbeth, Johnny Belinda, and Big Jim McLain? Those are the ones I remember him from, Sam might feel that some others are worthy of mentioning. He made 6'1" Ray Milland look like he was standing in a hole in The Univited. I think Napier had to be 6'7". I bet he was trying to get more work by downgrading himself, Arch. I saw a newspaper clipping from the 40s the other day Sam and he was quoted as saying 6 ft 5 in it! Napier's one of the few of the (rare) actors who claimed 6'6" that actually was believable as a full 6'6". Didn't have a solid 5 inches on Roger Moore in Alfred Hitchcock presents. More like 4. But Moore was a strong 6'1 so this guy was 6'5.75 at worst. Click Here for instance and compare his coat length to the other guy!! He really had an extraordinarily large torso. For a guy who was quite skinny you see his coats in some of his films they're outrageously big. He must have have suits specially made for him. In Journey to the Center of the Earth there is a scene in the laboratory with James Mason and Pat Boone and Napier's dress coat alone was longer than the torso and heads of both of them. If Mason had put on Napier's suit coat it would have come down to his ankles and probably dragged on the floor! Almost a head on 5'9" range Donald Crisp in the Uninvited. I think he was a strong 6'6" guy and 6'6 is the minimum he could have been. A clear legit 6'6" guy. Watching The Uninvited and he makes Ray Milland look short, looks near 5 inches taller. Milland I think was 6'1.5". Napier was also great playing Jean de Reske in "The Great Caruso". He indeed towered over Mario Lanza. I'm going to look up Lanza now. Napier had about 2 inches on Wayne actually, it was camera angle which made me think it was 3-4 inches. Alan had 5" on 6' 1" Adam West (as Bruce Wayne) in "Batman". Adam was never 6' 2", except sometimes in the Bat boots. Apart from it being obvious to the TV audience, a cast member of the show also told me this. Alan Napier has a solid 4+ inches on Adam West on the "Batman" television series. Taking into account that West is listed at 6'2" on this site, Napier would have to be a minimum of 6'6.5" tall. Napier had like 3-4 inches on John Wayne! DeEs, have a look at "Marnie" with Sean Connery, "Big Jim McLain" with John Wayne, and TV's "Batman" with Adam West, and get back to us again on Alan's height. You may be surprised! hmmmm. theres an old Alfred Hitchcock presents called the Avon Emeralds i think. where Roger Moore stars in with Alan. seemed to have a solid 3-4 inches on Moore. Moore was 6'1- 6'1 1/2 then so maybe Alan was 6'5ish?i got a 6'4 1/2 impressions from him but no more than 6'5 1/2. Thanks for that reference. I've seen Alan and Fess together in another episode and they were almost eye to eye. Fess was very tall and recently was upgraded by Rob to 6'6". I've seen him look even taller, perhaps he had the edge on Alan. I don't think anyone doubts that Alan was a true 6'6". TO SHADOW2 CHECK OUT YOU TUBE (DANIEL BOONE FINAL PART) WITH ALAN NAPIER. FESS IS AT LEAST 1 INCH TALLER THAN ALAN. He looked 3-4 inches taller than John Wayne in Big Jim Mclain. Sorry duder, if what you say is correct, then Sean Connery, Fess Parker, Adam West, and Cesar Romero would all have to be downgraded by 1.5". I think Alan is one of those rare men who never lost height as he aged. He never became stooped or put on weight, and seemed still the same height some years after "Batman" finished, as he approached his 70's. James Stewart is another example of someone keeping their peak height throughout their life. He sure was. He made his Batman co-stars look short, being 6'1" Adam West (6'2" in costume as Batman) and 6'2" Cesar Romero as the Joker. Around this time Alan also appeared with 6'1.5" James Garner in the war movie "36 Hours", and with same sized 6'6" Fess Parker in "Daniel Boone". Was this the same guy who played Alfred in The Batman tv show in the 60's? Many thanks Gonzalo for the great photograph of Alan and Connery from 1964's "Marnie". I'm wondering if you could also post it over on Sean Connery's page. It might remind a few contributors there that Connery was always 6'2" peak (188), not 6'3" (190.5). Ted only started doing TV and movies in 1964, with Richard Kiel first appearing about 1960. From 1950 to 1960 Alan was joined in Hollywood by 6'7" James Arness and several other 6'6" actors, including Chuck Connors, Fess Parker, Clint Walker, Buddy Baer, and Don Megowan. Alan was related to Neville Chamberlain former British PM. He looks more or less 6'7" opposite Adam West. Apparently he was from Birmingham, I didn't spot a Brummy accent in Batman! Well, 6'6" sounds rather correct but many websites have him at 6'5" too. After seeing him in Batman, as well as in feature films he appears to be closer to 6'7". Glad at least one Kid is seeing sense. Why anybody would even want to be as tall as 6'4" barefoot or taller beats me. Suppose its better than being 5'4" but you would be looking pretty freaky in most crowds if you were tall and rake thin like that. Definately the full 6'6". He was a human lampost and made even normally big men like Connery and John Wayne look short. 6 ft 5 in. I would say. Adam West was 6 ft 1 in, not 6 ft 2 in. I was surprised: in the film Isle of the Dead, Napier looked at most 6 inches taller than Boris Karloff. As always, he still looks taller than everyone. Well about claiming 6'4" at 6'6". I don't blame him, being beyond 6'4" is too tall even for me. I am about 6'4" maybe a tad less and I pray to god I don't get any taller. So I could king of see why he claimed himself shorter than he actually is, all though I did read many sites claiming 6'5". 6'6" sounds appropriate for this guy, because in batman he towered over Adam West, and also Cesar Romero. Could you guys keep updating his height as 6'6" on imdb so they could get it right? Napier is Scots, believe it or not. It's a "Norman-icized" name. My name is too: Stewart is the Norman form of Steubhardt. Not SURE what Napier WAS in Gaelic, but there are Napiers from Inverness where my Granddad hales from. Highlanders are inclined to be tall people. "Towering" over others can be kind of WEIRD! At 6'5" and 235 I have been accused of "looming"! :-) I certainly don't intend to "loom". I no longer slump about at my age. Bad for the back. Somehow I think Sean was no more than 6'1". That would make Napier about five inches taller which is just about the difference I see when I watch that film. Can you imagine being Napier and realizing that all the people you work with are relative midgets? He towers over the 6'2'' Sean Connery in Marnie. I'm just curious a little off topic but is napier a french last name? are his ancestors french? Saw the swashbuckler movie Frank2 is referencing a couple of months ago and even in sandles, Mr. Napier was a good bit taller than everyone else. And he was a solid 2" taller than 6'4" Vincent Price in THE SONG OF BERNADETT. 6'6" sounds right & quite a lean gentleman. He played Alfred the butler in the TV Batman series. Was a good 3-4 inches taller than 6'2" Adam West. Napier use to lie about his height by claiming he was only 6'4". His terrific height tended to keep him from playing the more choice roles. In Sinbad the Sailor he towered over Douglas fairbanks Jr. and Anthony Quinn. In fact Quinn who was most likely close to 6'2" only came up to Napier's eye level. Fairbanks who was about an even 6' came up to just above his chin. They say he is 6'5 on oksection and imdb. The only movie I know this guy from is sword and the stone. That's about it.